I'm back from Austin. It was AWESOME!!!! To Dave and Stephanie, you ROCK!!! I had such a good time at your house!!! I got to teach Stephanie to knit (that was awesome!!!) and I got to visit Hill Country Weavers. 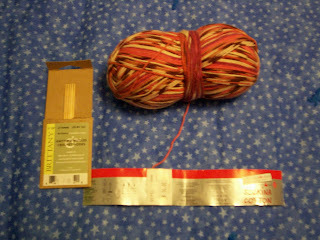 Here is Sockina Cotton, with wich I'm going to make these socks. I'm also pretty sure I spotted Vickie Howell. When I got up really early this morning, it was cold in Austin, and it's COLD here in OR. 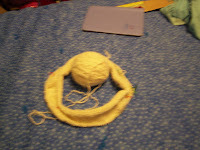 So I'm gonna work on my top down raglan. It's not yellow, it's cream. But you get the idea. Ish. Also - Stephanie, thank you for linking to me on your blog!!!! (That made me sooooo happy!) Look over on my side bar, what'dya see? Yup, a link to Sunbeam Soapbox!! Now, I have to go do the homework I didn't do before I left. See ya. I FINALLY got my big reasearch paper for AP European History (Henceforth AP Euro, or just Euro) done. It was only 7 1/2 pages, instead of ten, but OH WELL, I was just really glad to get it done. (I totally procrastinated). I'm really excited to be going to Austin to visit my Aunt & Uncle next week. I should start thinking about Holiday knitting, but I'm not sure what I want to make for whom. Plus I have some of my own stuff I want to finish up. I'm really glad I only have a four-day week this week. Dad's socks are done. They were done Wednesday, in fact. But now I have all this other stuff to do before I go off to Austin for thanksgiving. And I have Tap Workshop, cause when we get back, I'm planning on being in my school's musical this year - Thoroughly Modern Millie. No, I am not planning on trying out for Millie, I don't have the voice. But it's my last chance to be in my high school's musical, and I'll take it, thank you very much. I am hoping to get some shots of all my knits, maybe in Austin? We'll see. Today I don't have school (1st quarter grades - all good, except AP Euro - ack!!!!!) so I'm trying to do the homework that I didn't do all weekend. I wish I could post a long, Harlot-esque post, but a) I don't have that much to write about and b) I don't have the time to write about it. I am a high school student (not for too much longer though, thank God) and I have to work on raising that AP Euro grade. When I write a book, I will then (maybe) be able to write long posts for this blog. Unitl then, c'est la vie. Note to any blogger people who might be reading: BLOGGER NEEDS STRIKE THROUGH!!!! While it's too late to do NaBloPoMo, and I won't be doing NaNoWriMo, because I don't think I can attempt writing a novel yet, I am going to do NaKniSweMo. Also NaCoAppMo, [National College Application Month] (Of my own invetion) cause I want to get the darn applications in before Thanksgiving. So I cast on for a top down raglan last night. We'll see how it goes.